Deathworld Fauna – Part 1.1 – Scotia Grendel Dungeon Crawler (Leech) | Azazel's Bitz Box. Back in March, I found two out of the three figures from the Scotia Grendel Dungeon Crawlers kit that I picked up bout 15-20 years ago. (Damn that makes me feel old!) Because of the way that things seem to work in my life and on the painting desk, the frog-thing and millipede-thing have been MIA for a couple of months now (they might be in the shed, perhaps?) 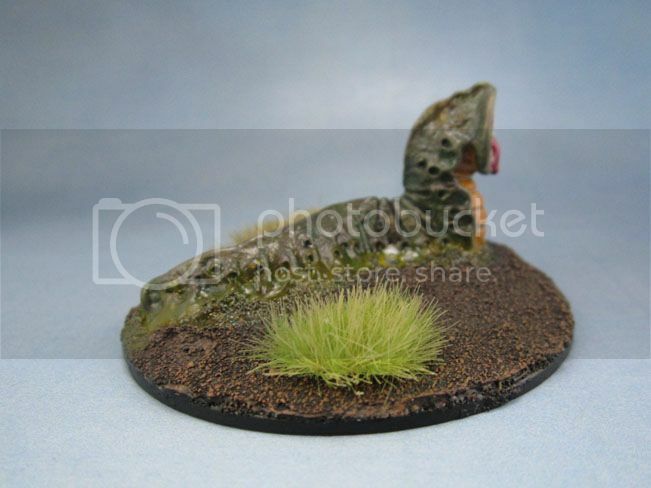 and I ended up finding the leech-thing, conveniently already glued to a 60mm base with some putty ’round the edges. Not wanting to tool around too much rebasing and agonising over the scheme – since that’s a great way to never get anything finished – I decided to get that sucker painted. I figure this thing can work just as well as a 40k-sci-fi alien leech as a D&D-style fantasy giant leech. So, you know, whatever. I went with green and mustard yellow since the underside was sculpted with a bit of contrasting texture, so I thought I may as well transfer that to the palette. Same deal with the pinky-purple tongue and the bone teeth, again so they stand out. A nice thick layer of polyurethane varnish on the model keeps it looking suitable shiny and yucky. I also added some Vallejo realistic water mixed with some transparent yellow to create the slime effect on the side of the model where the slime-holes(!) are located, and some realistic water without colouring onto some of the mouth-parts and tongue. I found that the figure looked too small for its base, and to help fill in the empty space without going overboard – or adding in fantasy or sci-fi-specific extras, I just went for some of the larger tufts that I had sitting around in the packets. 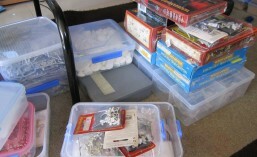 Often those are the hardest ones to find a use for and they end up on scenery, since they’re too large for use on almost all miniatures. 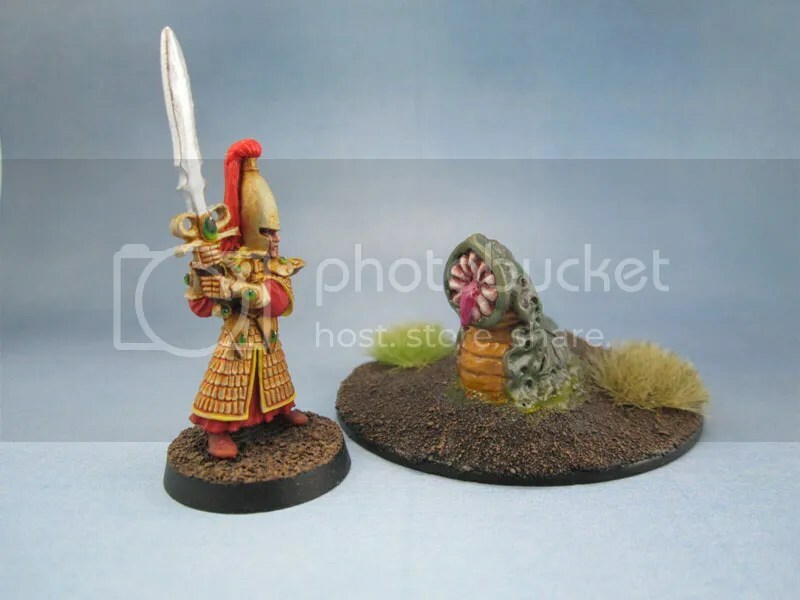 Scotia Grendel Dungeon Crawlers Giant Leech with Warhammer High Elf for scale. 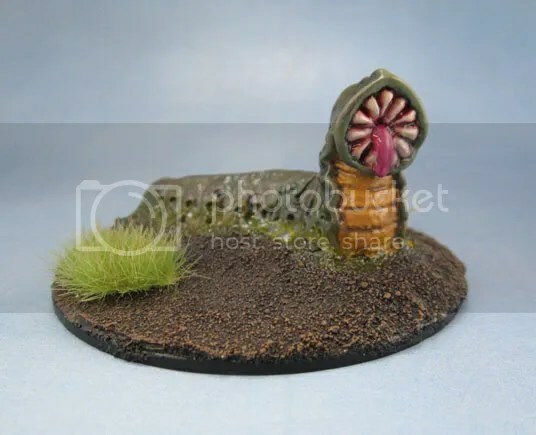 This entry was posted in Fantasy Gaming, Sci-Fi Gaming and tagged Giant Leech, Giant Slug, Scotia Grendel, Scotia Grendel Dungeon Crawlers. Bookmark the permalink. Nice! Truely disgusting with those slime holes! I feel the base could be improved by adding a bone or some more stones or tall grass here and there. 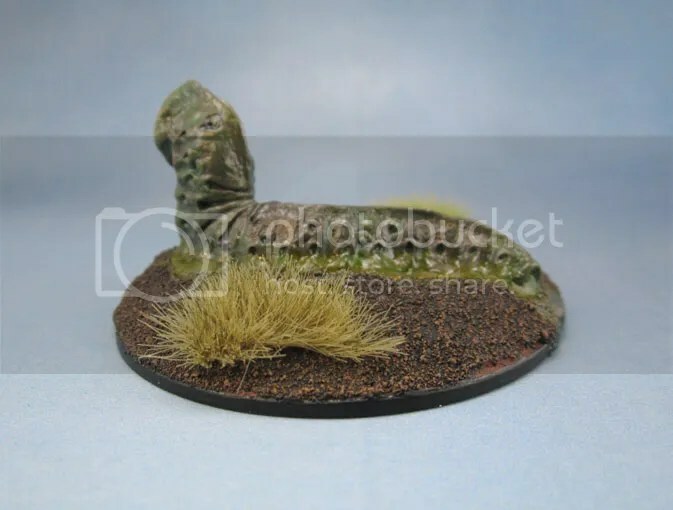 Might also be an idea to give the bush a wash with brown, to tone the green it down a bit. I like the golden armor of the high elf. Very nice contrast with the red and green. The jewels also look very realistic. Great job! What is your impression of the Mordor game? It looks excellent, but some reviewers claim it loses its appeal after playing it for some hours? The base is a bit bare, and if I had started it more recently, I’d have embedded some stones or what have you (cat litter!) into the putty, but when I found it, the base was already puttied and had the sand glued down. I prefer to keep bones off it, since those are a feature of my Ogre army – just as flowers will be a feature of my dark and possibly also my high and wood elves. The green on the bush isn’t as overwhelming in person as it appears in the photos, mostly due to the size being considerably smaller than in the photos – though I do that when using static flock, since that stuff is really bright! The theme for my High Elves is/going to be based on the Blood Elves from World of Warcraft. While the typical blue and white ones look lovely, I want something that stands out as quite different to the most common, if not especially original. The red and gold also gives them a little bit of a “Hollywood Roman” feel to them as well. Good work, its horrible. Its definitely cross genre compatible too. Pingback: Deathworld Fauna – Part 1.2 – Scotia Grendel Dungeon Crawler (Giant Centipede) (#Monstermarch3 ’19, Gender-Ambiguous March ’19) | Azazel's Bitz Box.